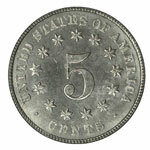 The copper-nickel five-cent piece was first introduced in 1866. It was issued to redeem and replace the unpopular five-cent paper notes, which were themselves replacements for the silver half dimes driven from circulation by the hoarding of all silver and gold coins after 1861. Though the public yearned for coins of silver and gold, they readily accepted the base-metal nickels as a temporary substitute. Of course, the half dime was discontinued in 1873, and the homely nickel remains to the present day, unchanged except for its imagery and for a slight increase in diameter beginning in 1883. Shield nickels have enjoyed only modest popularity with date collectors, though they offer a particularly rich hunting ground for variety enthusiasts. The hardness of the .750 copper and .250 nickel alloy was brutal to the die steel available during the years this type was coined, 1866-83, and the dies frequently cracked. This problem was particularly acute with the first subtype of the Shield nickel, which featured rays on the reverse. Issued only during 1866 and early 1867, these coins were especially subject to weakness of strike and other technical deficiencies. Omission of the rays provided only partial relief, and coins of this type were characterized by missing details through most of the series. 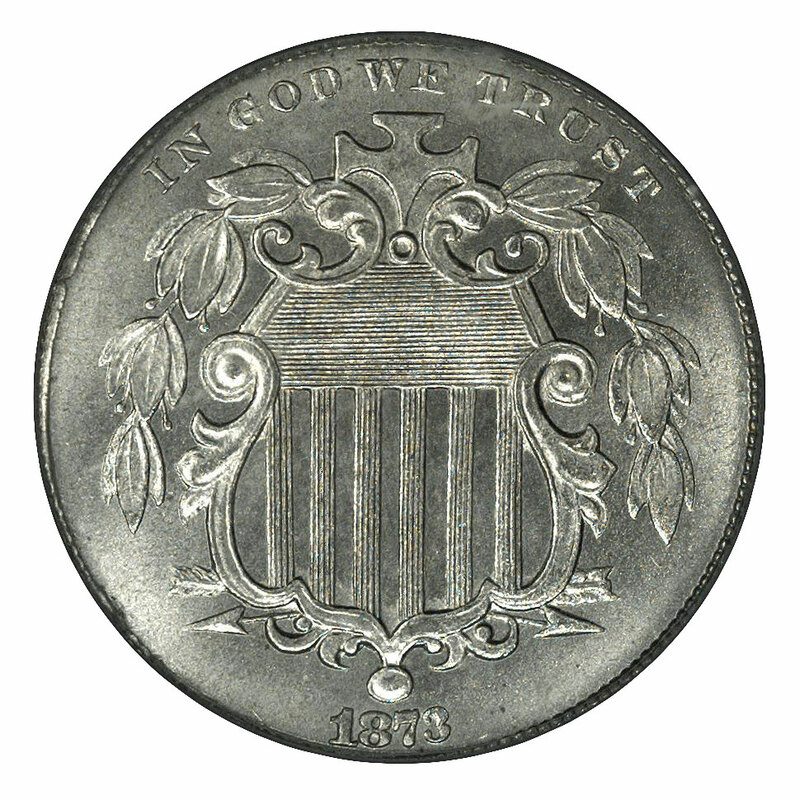 Shield nickels are occasionally seen weakly struck, and with the horizontal lines joined, even on Uncirculated specimens. Many of the early dates are unevenly struck, with weak spots in details. Weakly struck coins are a problem when grading mint state specimens and those in the higher circulated grades of Extremely Fine and About Uncirculated. Below those grades, any weak spots tend to be eradicated by wear, as weakness is typically seen in the highest points of the design that wear first. Circulated Shield nickels are quite easy to grade using the illustrations and text in the ANA's grading guide. Some Shield nickels are not fully brilliant, even when technically uncirculated, or mint state. It's likely that they were simply made that way from improperly cleaned and polished planchets. This problem existed at the U. S. mints as late as the 1960s, though more recent issues seem to be of consistently higher quality. One of the most persistent problems in assigning a grade to unworn Shield nickels is distinguishing between proof and non-proof specimens. This is particularly true of certain date spans, the years 1877-81 coming to mind. The 1877 and 1878 nickels were produced only as proofs, yet examples are known which don't fully meet the conventional criteria for proofs. Their fields are not fully brilliant, their rims and edges are not squared, and their strikes are incomplete. Since no nickels were issued for circulation bearing those dates, we must call them proofs, even when they do not live up to expectations. In a way, however, this provides a valuable lesson for distinguishing the proofs of the years immediately following — 1879, 1880 and 1881. Because of their very low non-proof mintages, the nickels of these dates made for circulation were struck from dies which lost very little of their initial brilliance. Combined with the fact that the Mint was somewhat careless in its making of proofs during this period, the result is that both proof and non-proof nickels look very much alike! Even the professional graders at Numismatic Guaranty Corporation must study these coins carefully. With all their experience, the distinction between proof and mint state is often a challenging one. 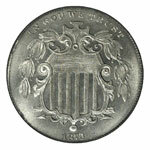 Another Shield nickel for which distinguishing proofs from currency strikings has proved difficult is the 1867 With Rays. Scholar Walter Breen asserted that the few known proofs of this subtype were struck clandestinely. Like the proofs of 1877-81, these are typically not as brilliant as the proofs of other dates. Perhaps because of the hardness of their alloy and also because of their odd proportions (nickels are too thick relative to their diameter), proofs of the Shield five-cent piece seldom have the fully squared rims and edges that one associates with proof coins. Still, with the exception of the few dates named above, proofs of this type are usually quite distinctive in their contrasting frosted devices and mirrorlike fields.